Boys, if left to their own devices, will inevitably make weapons and “play” with them. Hannah Montana is ONLY for girls. Performing shows is a girl-only pursuit. Boys can only play with old dolls, not new dolls. Boys are VERY likely to break toys, even if they are age-appropriate. “Kids mostly get meaner as they get older.” A direct Q quote, and it bore out, unfortunately. Boys in velvet pants get NO compliments. Boys are not beautiful, only handsome. Leaving our dear little bubble is hard. Very hard. What did you and your loved ones learn this holiday season? No, this is not turning into a consumer blog. But, I thought I’d share a bit of my thinking around gifts as it’s on my mind a lot at this time of year. I cringe when I see some of the things people get Q. If they really knew him, they wouldn’t get him pirate things or books with violence, etc. But some of these folks don’t know him. They know he’s a boy, and they look for what they believe to be boy things. Ugh. When folks ask what Q might like, I’m thrilled! Sometimes the list will include something with fairies or glitter, but I mostly just try to stay gender-neutral and high on the creative possibilities. Here are five different ideas that are easy to come by at the last minute, don’t necessarily involve mail order, and have a huge price range. So if you’re in need of finding something that doesn’t “gender funnel,” have a look! Five gift ideasthat you’ll never find in the pink and blue of aisles of certain big-box stores. 1. Pipe cleaners – ingenious. These inexpensive items (usually about $2) can be turned into literally anything. While my son prefers to make earrings, necklaces, and bracelets out of them, others fashion them into people, complex geometric figures, never-ending chains, food items, etc. The possibilities are truly endless. 2. Magnets. There are so many different magnets that you can find for kids to play with. From magnatiles (Q LOVES these), which appeal to a wide age range (and don’t have the small pieces dangerous for little ones) to the technical goobi packs that allow kids to build with multiple magnet sizes and connectors. Kids love to play with magnets. Heck, I love to play with magnets. There’s something mesmerizing about magnetism. It’s sort of like a magic power. 4. Science kits. Like magnets, science kits, especially those involving dramatic chemical reactions, are fun for everyone. Take a pinch of this, a scoop of that, add them together, mix, and whoosh! You’ve got some sizzling, smoking, gurgling fun. 5. The basics: Paper, markers, crayons, scissors…and don’t forget the glue! You can’t avoid the basics when thinking about kids. In fact, so many folks try to get fancy toys and supplies for their kids that many kids are actually lacking these basics. But kids can never have enough paper (especially colorful paper), markers, crayons, scissors, or glue (glue sticks to avoid the huge mess, please). Again, the possibilities are endless. Cut out shapes, glue them on paper. Make 3-D models. Draw mini pictures. Draw huge pictures. Really, the enjoyment could last forever, and your kiddos will be able to express who they are through their creations as opposed to the supplies and toys dictating who they should be. When we give kids toys like these, we send them the message that we know they can create, that they can explore, and that they can be who they want to be. Their playthings don’t box them in, which is so important when what they see around them in the world so often boxes them with subtle messages. The beauty and freedom of creating! Just pause for a moment to consider this. The recognition of everyone’s dignity. Everyone has equal rights. And this, just this, is the “foundation of freedom, justice, and peace.” Sounds simple, right? On paper, these words make sense and I’m sure few would disagree with them. But look around you, and you’ll see that plenty of messages abound that fail to recognize the dignity that we all have within us or that fail to give us full rights. Take, for example, children’s toys. A simple walk into a large toy store tells you that boys have the “right” to play with certain toys and girls with others. And it is NOT “right” if they play with each other’s toys. Even if they want to, someone is bound to tell them it’s wrong, whether it’s a peer making fun of the boy with the doll or a grandparent telling a granddaughter that trains are only for boys. What happens, in these small moments, to the dignity of that boy and girl? Slowly, in a split second, it is diminished. Perhaps only a bit, but it is diminished. And their rights? They too, are narrowed. That boy has his right to play with dolls called into question. Similarly, the girl’s right to play with trains is called into question. While that may seem minor, it is the underlying message that is troubling. And these are not just messages sent by misguided friends and relatives. These are messages that bombard us and our young ones everyday, from every direction. Messages that don’t just say “you can’t play with dolls,” if you’re a boy, but that say “you are not a nurturer; you are not a caretaker.” Or “you are not an engineer; you cannot create and build.” These bigger messages cut away the core of children’s human rights – the right to have wide-open futures. The right to explore all areas of life, to develop their own passions, regardless of the social pressures placed upon them. Returning to the Universal Declaration of Human Rights: When we deny children these rights of self-expression, exploration, individuality, we deny ourselves and our society freedom, justice, and peace. When you think of it like that, the simple boxing in of our children or denying them certain avenues in their play sounds profound. And it is. And it’s time that more of us pay heed and think twice before we cut away at freedom, justice, and peace. a boy's place is in the kitchen! **Note: You can find a version of this article posted on the Gender Examiner — another venue where I’ve begun to contribute. Have a look! Finally! The legos we’ve been waiting for! Phew! Now that legos come in pink, Q will play with them. Just what I’ve been waiting for. Because you know, since he loves pink so much, he hasn’t been willing to play with them before, given the color choices. Frankly, I’m disgusted. 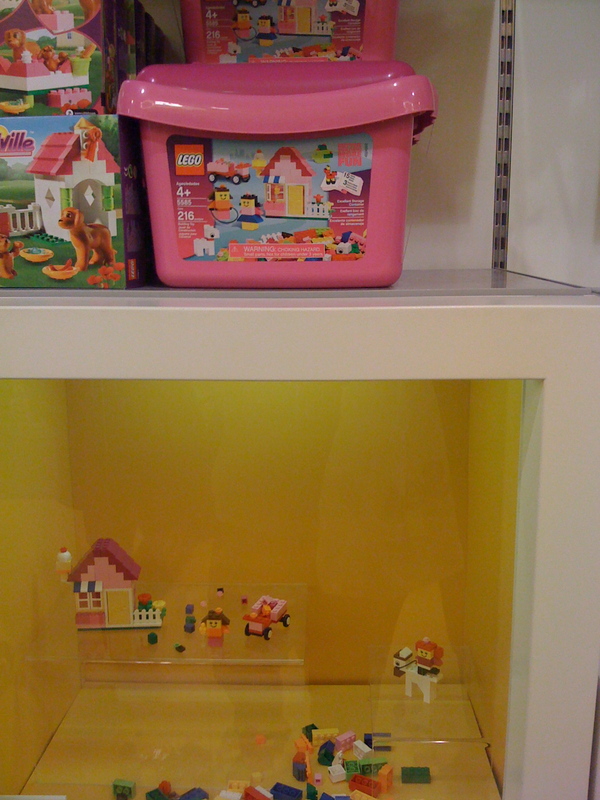 Pink legos. And the pink legos are to make a house/dollhouse, replete with flowers. That definitely has to be pink. To attract the girls. All the warships/spaceships/star wars stuff — that’s fine in black and grey because it’s for boys. Just another insipient message to our kids about what they should like or what they should play with depending on their color preferences. Or, vice versa, what kinds of colors they should like, depending on their play preferences. Can’t we just let these poor small beings be? Choose what they want? Like what they like? Jeez.